Born in 1941 in Tacoma, WA, Dale Chihuly was introduced to glass while studying interior design a the University of Washington. Chihuly continued his studies at RISD, where he later established the glass program and taught for over a decade. 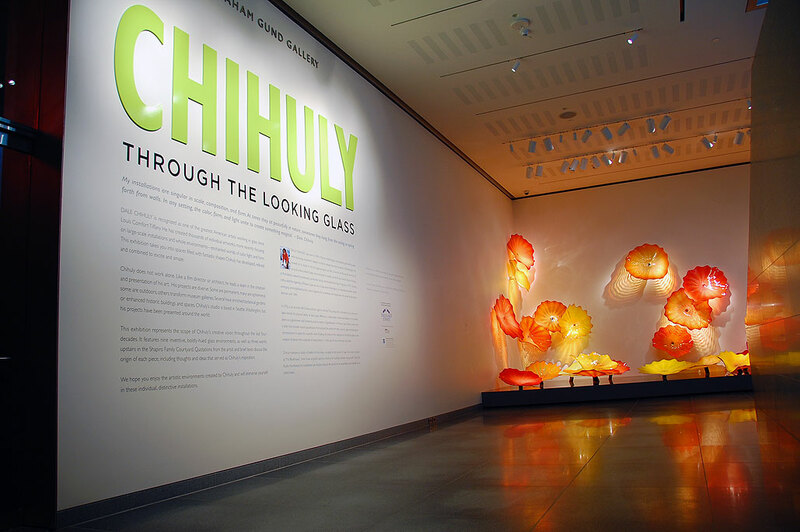 Over the years Chihuly has worked with hundreds of museums worldwide. On April 10th, Bostonians will get a spectacular view of Chihuly’s work at the newest exhibit Chihuly: Through the Looking Glass at the MFA. The MFA exhibit features 12 breath-taking installations in the new wing. They are in the Shapiro Family Courtyard, the surrounding gardens, and in the Ann and Graham Gund Gallery downstairs. Stepping down to the exhibit, visitors are greeted by the Persian Wall, a welcoming collection of flower-like glass shapes in orange, yellows, and reds. Immediately inside the gallery is the Scarlet Icicle Chandelier, a 6′ high glass and steel construction which is fascinating both for how it is lit and for the shadows it throws. 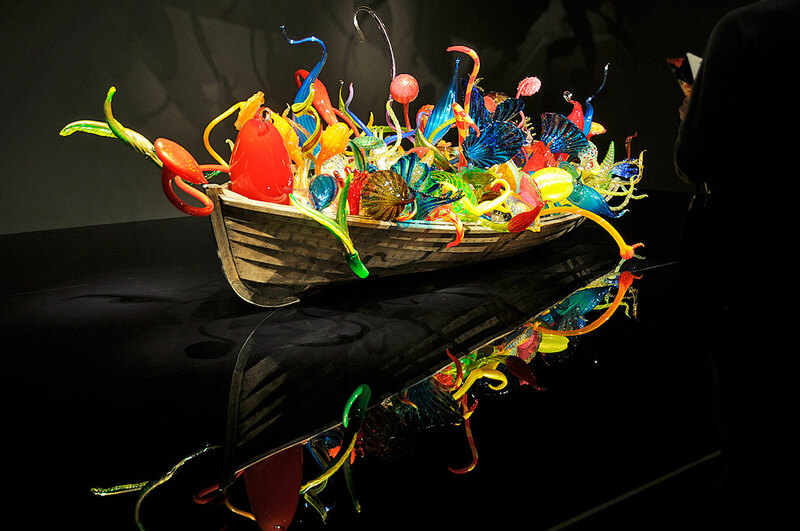 A bit further in is the first of Chihuly’s Ikebana series, the Ikebana Boat. Ikebana is the Japanese art of flower arrangement. Just like one could spend hours contemplating an artful ikebana, the same is true of this piece and the Ikebana series. We won’t spoil it for you by showing you too much of the series, but will talk a bit more of the boat. The composition is an arrangement of strangely organic shapes bursting out of a 17′-long wooden rowboat. The reflection of the “flowers” on the very calm “water,” actually black acrylic, makes for an eerie contrast. 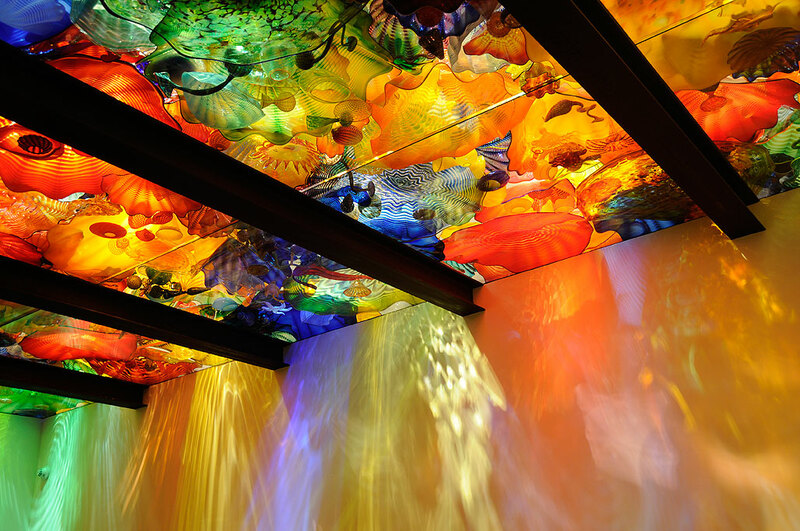 Not all of Chihuly’s pieces are wild and crazy. The Mille Fiori (Italian for “a thousand flowers”) and the NorthWest Room could not be more different. It was difficult to believe they were conceived by the same artist. Further in is the Persian Ceiling, an amazing 15’x25′ overhead platform of vibrant colors and shapes. Looking up, it felt like we were underneath an aquarium filled with giant multi-hued jellyfish. The effect was mesmerizing. The last two room (Chandeliers, Neodymium Reeds) are also large-scale installations and just as fantastical. The Chandeliers are very complex constructions with thousands of elements. The Reeds are deceptively simple tall glass rods which took Chihuly a while to figure out how to construct. To complement the exhibition, the MFA is offering a variety of special program, including a two-day glassblowing event on Mother’s Day weekend (May7 and 8) showcasing free demonstrations by artists from the Diablo Glass School of Boston, as well as activities for children during school vacation week in April. Check the MFA site for more details.